With so many distractions, like TV, video games and ipads, children are more likely to feed a couch potato lifestyle. However, as a parent, it is your responsibility to encourage your child to be active, for health, fitness and to enjoy the social aspect being part of a team. Here are a few tips to get your child active. Boost your child’s confidence – To build your child’s skills, take sometime from your busy schedule, to show your child skills like throwing, catching and kicking a ball. Even if your child takes sometime to master these skills, you should always provide a lot of encouragement. 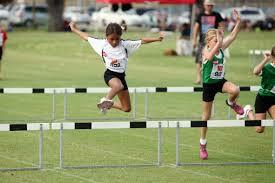 Be supportive – Your child may feel that he/she is not as athletic as his/her peers. Remind your child that they are still growing and that they have not reached their full potential. If they are not doing well at one sport, ask them to try something new. Choose the right sport – Find a sport your child can succeed in. If standard sports like basketball, swimming and tennis don’t interest your child, try dance, golf or boxing. As your child gets older, they may feel that school sports teams are only for the elite and are very competitive. If this is the case, enrol them in a church or community center team. Share your skills and experiences – If you have been part of a sports team in school, you should share your experiences with your child. Explain to them what you liked most about the game and what areas you felt required more practice.